Abraham Clapham was a keen naturalist and horticulturalist specialising in the rearing of ferns. Originating from Leeds he was and active member of the Leeds Philosophical and Literary Society, donating a wide variety of objects to their museum including several mounted birds of prey, a number of which are still in the Leeds collection. After moving to Scarborough, he became an active member of the Scarborough Philosophical Society, again contributing both materially and financially to the society's museum. He seldom published, but a lecture he gave to the Scarborough Philosophical Society is reproduced in their Transactions. As a collector he is mentioned frequently in a number of books on Ferns, specifically in Fern Growing (1898) by Edward Joseph Lowe, which gives it's own biography and a includes the portrait shown on the left. 1810 May 29 : Birth Abraham was born in Woodhouse Lane, Leeds, the son of Thomas and Mary Clapham. Marriages- On the 3rd Inst., at York, Abraham Clapham, Esq.,son of Thomas Clapham, Esq., of Stackhouse , Settle, to Mary Anne Thistleton, daughter of Charles Alfred Thistleton, Esq., of Heworth Cottage, York. CLAPHAM- at Worthing. 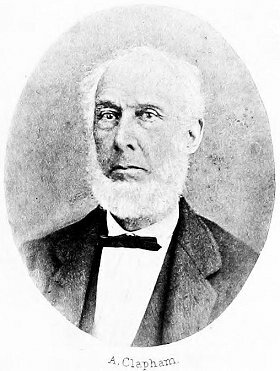 Abraham Clapham. late of Scarborough, in his 78th year. Friends will please accept this intimation. Annotated family tree of the Clapham family. Clapham, A. 1855. "On the viviparous properties of out native ferns" Report of the Scarborough Philosophical and Archaeological Society, 23, 53-56.